Egg protein contains all the essential amino acids your muscles need for good recovery. Besides having 30% DV of vitamin K, necessary for strong bones, eggs also contain choline, a brain nutrient that aids memory, and leutin, known to reduce risk of eye diseases. What runner, or any person for that matter, doesn’t want a memory enhancer? Nowadays, you can purchase omega-3 enhanced eggs to boost your “good” fat intake, or fats key to aiding the body’s inflammation response. Some runners may worry about the 213 mg of cholesterol in the average egg. Many studies, however, have actually shown that egg eaters have a lower risk for heart disease than those who push eggs away. Don’t discard the yolk either, as it’s jammed packed with important nutrients and essential fatty acids. On the days you eat eggs, limit other sources of cholesterol. Preheat oven to 375 degrees. 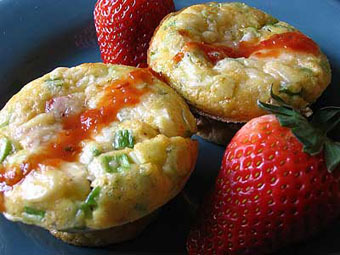 Spray muffin pans with non-stick spray or line with paper muffin cups. Whisk all ingredients together; fill muffin cups ¾ full. Bake 30 minutes, or until eggs are set and just slightly browned. Drizzle Picante Sauce for added "wow!" Muffins will keep for 4 days in the refrigerator for a quick grab later in the week, and they can be reheated in the microwave.